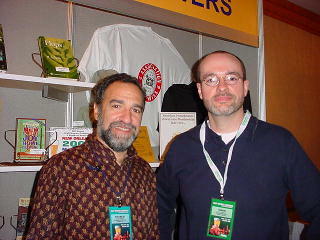 Here's Charlie Papazian (author of The New Complete Joy of Homebrewing and one of the founders of the Association of Brewers) and Owen Ogletree on the exhibition floor of the 2002 Craft Brewers Conference. 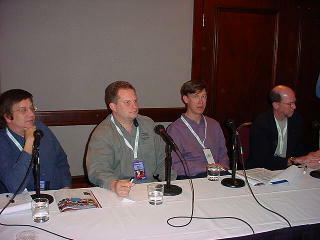 I was fortunate enough to have the chance to attend the 2002 Craft Brewers Conference and BrewExpo America held April 10-13 in Cleveland and presented by the Institute for Brewing Studies. The conference featured several informative guest speakers (some of which are pictured below) from the craft beer industry and attracted brewers and other folks involved in the operation of breweries and brewpubs from around the world. There were also exhibition booths that featured worldwide suppliers, including companies from the restaurant and brewing industry, that showcased their wares. A silent auction was held to benefit American Beer Month with brewery posters, t-shirts and more. 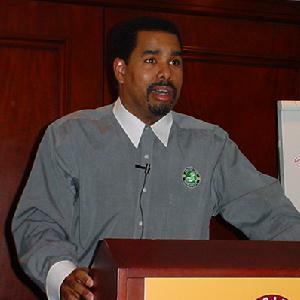 The world's foremost beer critic, Michael Jackson, was also on hand to give a stirring, optimistic opening talk concerning the current state and future of the craft beer industry. Along with the exciting happenings at the conference, I was pleased to visit two of Cleveland's best places for beer -- Great Lakes Brewing Company and Cleveland Chophouse and Brewery (see photos near the bottom of this page). Cleveland rocks! 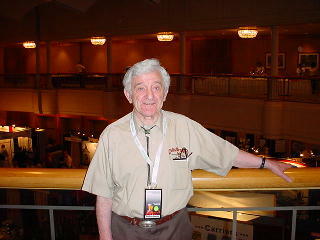 Michael Jackson is recognized as the world's leading beer critic and is Director-at-Large of the North American Guild of Beer Writers. Michael presented the keynote address at this year's Craft Brewers Conference which delivered a message of a very bright future for the craft brewing and beer industry. Pictured above are Chuck Skypeck (Boscos Brewing Co.), Mark Edelson (Iron Hill Brewpub), John Hickenlooper (Wynkoop Brewing), and Pat Conway (Great Lakes Brewing Co.) who discussed what it takes to have a truly successful brewpub. Garrett Oliver (head brewer for Brooklyn Brewing Co.) delighted the conference crowd with his talk concerning pairing beer and food. 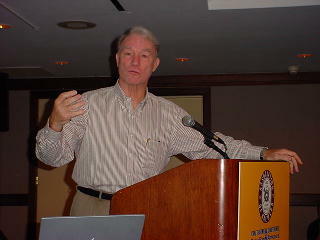 Garrett presented several arguments that convinced most attendees that beer is superior to wine with certain dishes. I ran into Pierre Celis who was also attending the Craft Brewers Conference. Pierre is largely responsible for resurrecting the style of Belgian White Ale with his work with Hoegaarden in Belgium and later with Celis Brewing in Austin, TX. Pierre told me that his equipment from the closed Celis Brewery is now at Michigan Brewing Company. He now lives in Belgium and is brewing Celis White there in association with a Belgian brewery. This new Celis White is only available in limited European markets. Dr. Maribeth Raines-Casselman, Senior Research Scientist for Biosource International, discussed how to maintain cultures of rare yeasts and bacteria for use in brewing. These microorganisms are able to contribute unique depth, complexity, and character to certain styles of beer. 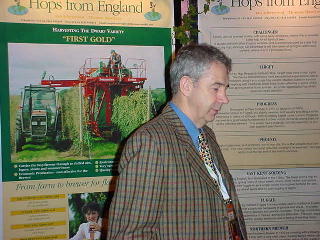 Pictured above is Ian Iserwood who represented Hops from England at the Brewers Conference. 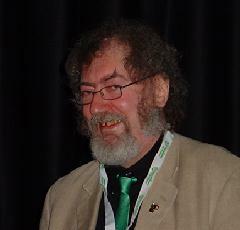 Ian occupied a booth in the exhibit hall that distributed information about his company's new dwarf hop breeds. 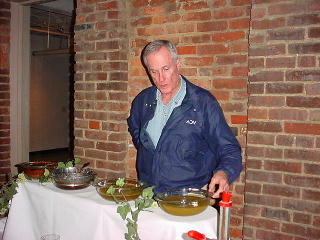 These hops are distributed in the United States by Crosby and Baker Ltd. Brewers gained a wealth of knowledge regarding sensory perception of beer flavor at a discussion presented by Dr. Michael Lewis of the University of California at Davis. 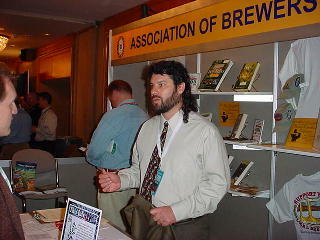 Paul Gatza (director of the Institute of Brewing Studies since 2001) was available at the Association of Brewers booth to field questions pertaining to the Craft Brewers Conference, Great American Beer Festival, and beer/brewing in general. Attendees at the 2002 Cleveland Craft Brewers Conference were able to visit two exceptional brewpubs in central Cleveland. 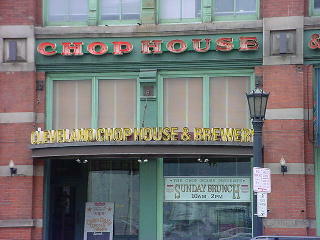 The Cleveland Chophouse and Brewery (824 W. St. Clair) features delicious beer and food (including a popular Sunday Brunch). 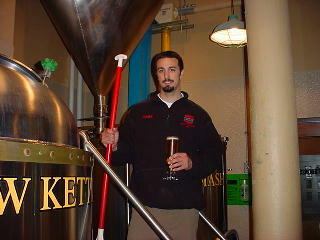 Toby Parsons is head brewer at the Cleveland Chophouse Brewery and produces some wonderful ales and lagers. His Bohemian Pilsner won a gold medal at the 2001 Great American Beer Festival and is one of the most hoppy and flavorful Pilsners I have ever had. Chophouse's Irish Stout is a beautiful, complex dry stout with loads of roasty character, and the seasonal Bock is malty and medium-bodied with delightful toffee and caramel tones. 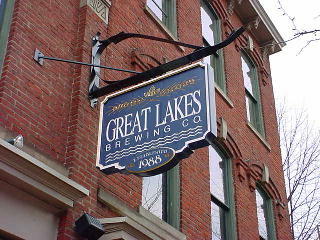 I must agree with many that Great Lakes Brewing (2516 Market St.) is one of the very best brewpubs in the U.S. 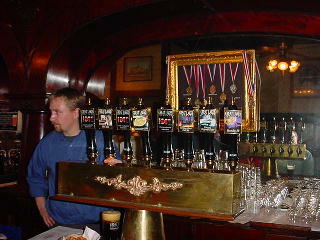 The brewpub is across the street from their impressive microbrewery and features outstanding food and beer. The entire complex has a friendly, homey feel that reaches into the heart of any beer fan. The bar at Great Lakes featured nine house brews when I visited. The Burning River Pale Ale was so fresh and hoppy that I thought it had to be an IPA. Lovers of dark beer will fall for the Edmund Fitzgerald Porter that exhibits perfect chocolate-coffee notes and a bold hop finish. The Rockefeller Bock and Eliot Ness (Amber Lager) both boast of rich malt, toffee, and caramel flavors with floral, noble hops. Try the salmon dish with the Pale Ale and the Eliot Ness with any of Great Lake's earthy mushroom dishes. The Great Lakes Brewery tour conducted by Terry Ryan winds you through the outside and inside of the impressive microbrewery. The tour guides use grain, bowls, and strainers to illustrate the brewing process. 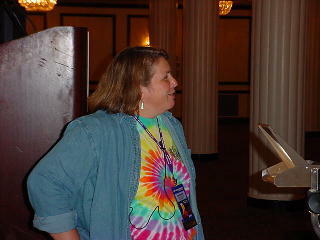 Tours are usually offered on Friday and Saturday afternoons. Great Lakes Brewing has the goal of being one of the country's most ecologically friendly breweries. Shown here are bags of spent grain that are providing nutrients to grow some very tasty mushrooms used in the brewpub's kitchen. 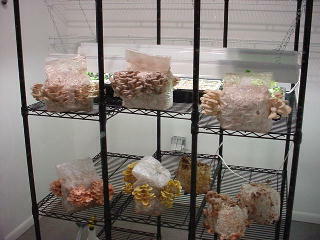 Their organic mushroom pizza made from these 'shrooms is incredibly delectable.